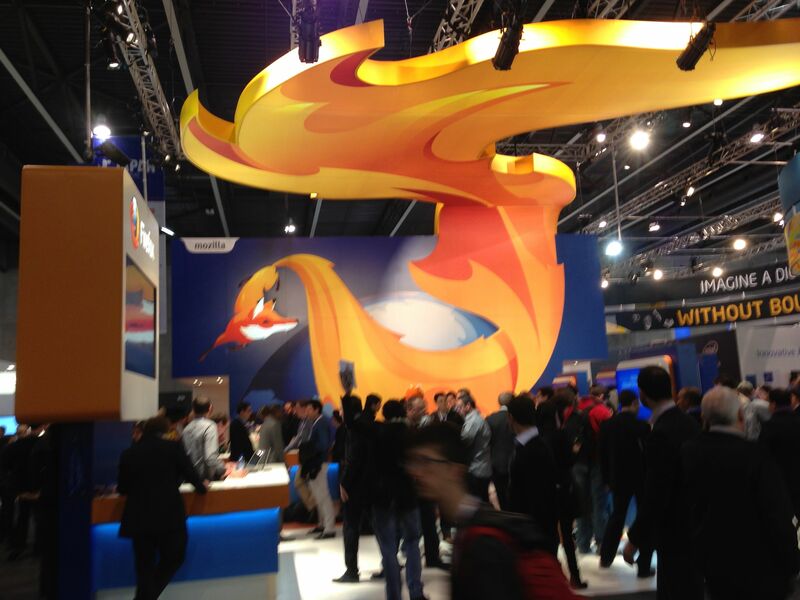 Last week started with a bang, with Mozilla’s Firefox OS launch at Mobile World Congress 2013. 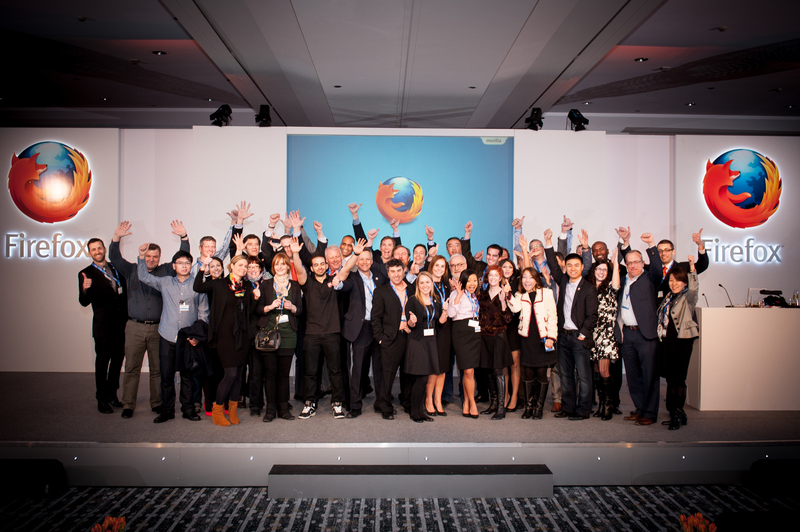 We announced that Firefox OS had won the support of 18 carriers, four device manufacturers, and a major chipset company (Qualcomm) at a barn-burner of a press conference in Barcelona on Sunday night. Two days later, the excitement ramped even higher with news of a fifth device maker, Sony. Our success in attracting support from these partners is due in part to our ability to innovate and standardize the heretofore-missing APIs needed to build fully-capable smartphones purely from web standards. Therefore I will give an update below to my post from last MWC with details on API standardization progress over the last year. We are collaboratively building these APIs to fill real gaps in the standards. 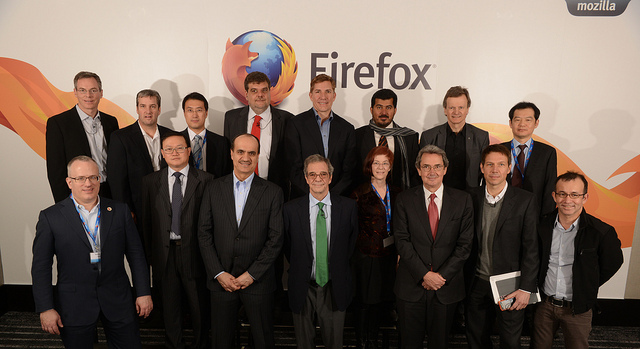 We actively work to get them standardized across all operating systems and browsers, as part of Mozilla’s mission. We have made terrific progress in the last year thanks to Firefox OS, and many of the APIs work in Firefox for Android too. Coopetition for web developers has already caused Samsung to patch WebKit to support some of these APIs. We will continue to update API specs and code as new devices and sensors come to market. The missing APIs must be added to the web platform in order to enable the billions of new mobile users who will be coming online in the next few years to have affordable web-based phones, tablets, and apps. Emerging market consumers and developers generally cannot afford increasingly higher-end, native-app-advantaged smartphones from the two bigs. The main reason that many developers historically have turned to native OS-specific app platforms and tools is because that was the only way to work with the different hardware elements and proprietary features (e.g., battery status, dialer, SMS, payments system) present on mobile devices. Those developers who bravely soldiered on, trying to use HTML5, were forced to envelop their code in compiled native app wrappers such as Phonegap generates. There was no technical reason for OS proprietors to disadvantage their web stacks, lock developers into their native stacks, or make their store an exclusive trust anchor. Yet the incumbents did hold the web back by withholding APIs. Just as the first browsers’ creators exposed file pickers and alert dialogs to work with the underlying OS, we are finally filling in the web platform to include the missing smartphone APIs. This levels the web vs. native playing field. And by following our usual best practices of working in the open and submitting all of our work to the standardization process, we can be confident that the missing functionality will become available on all platforms eventually. When these APIs are available on all web rendering engines — even desktops and laptops, where the APIs make sense — then developers can be sure that their code will run interoperably, no matter what the underlying operating system. Fragmentation, if any, could arise at the OS level, e.g., due to not updating the OS’s web engine (as happened in Android 2.3). Barring OS-specific update failures, developers can be sure because they have consolidated cross-OS, cross-browser market power. In today’s competitive browser markets, web developers rule the roost; browser and web engine purveyors seek to win their favor. Developers will not bother with up-and-coming operating systems that deviate more than epsilon from the standards. The example set by our good friends at Samsung in patching WebKit based on the new specifications validates our approach. It means that if Tizen devices become numerous, it is highly likely that mobile web applications that work on Firefox OS will work on Tizen. Likwise, we are working with Microsoft on Pointer Events, since touch-enabled web apps must today unify mouse and touch events, and the previous W3C multi-touch work foundered on patent assertions. Other performance enhancements include continued work on off main thread compositing and GL layers. Yes, it’s true: the modern mobile-focused web rendering model includes implicit threading in the form of the Compositor thread, and the GPU’s parallel hardware. As always, standards in progress are subject to change, but they require prototype implementations and user-testing (“user” meaning both developer and consumer). Mozilla remains committed to playing fairly by not forging de-facto standards out of prototypes, rather proposing before disposing and in the end tracking whatever is standardized. Battery Status is now a W3C Candidate Recommendation (CR), and there was discussion recently about moving it to Proposed Recommendation (the last step before a REC, the status of an officially endorsed W3C recommended standard, indicating readiness for deployment within its problem domain). WebTelephony. Mozillians: Ben Turner, Jonas Sicking, Philipp von Weitershausen. This is being worked on by Intel and Telefónica folks as the Telephony API in the SysApps Working Group. WebSMS. Mozillians: Mounir Lamouri, Jonas Sicking. Being worked on as the Messaging API in the SysApps WG. Pointer Lock: this API is largely stable and implemented in multiple browsers. Mozilla is participating in the W3C Pointer Events working group along with Microsoft, Google, Opera, jQuery, and others. Mozillian: Matt Brubeck, together with Microsoft’s Jacob Rossi. Open WebApps has been proposed to W3C. We seem to have reached consensus to use the Mozilla proposal as a “First Public Working Draft” (FPWD) in the SysApps WG with Samsung as co-editor. Alarm API is now a W3C working draft. Intel is helping edit, a great example of collaboration. Web Activities, a simplified version of Web Intents. We focused on a simpler subset of Web Intents, which has proven to be a good idea. The feature set of Web Activities is working well, while Web Intents is currently going through a restart. Push Notifications. This API is still in an early state. We have some prototypes but not yet shipping code. Getting this right is hard given that we want to create something secure, scaleable, and highly available. WebFM API. We have an initial draft, but the W3C SysApps WG has decided to focus on a smaller set of specs first to build common ground. This API was deemed to be lower priority and so will have to wait a bit before it goes through standardization. WebPayment, implemented by Fernando Jiménez Moreno of Telefónica. There is a W3C Community Group entirely focused on payments, and now a W3C Task Force. We will work in these groups to make a flexible API for payments part of the web standards. Ambient light sensor, Mozillian Doug Turner is serving as editor. Proximity sensor, note Doug Turner in acknowledgements. UPDATE: Contacts Manager API, Eduardo Fullea and Jose M. Cantera of Telefónica are editing. Developers interested in getting to know the new APIs better should look at this Mozilla Hacks post by Robert Nyman, which provides guidance on how to use them along with code examples. 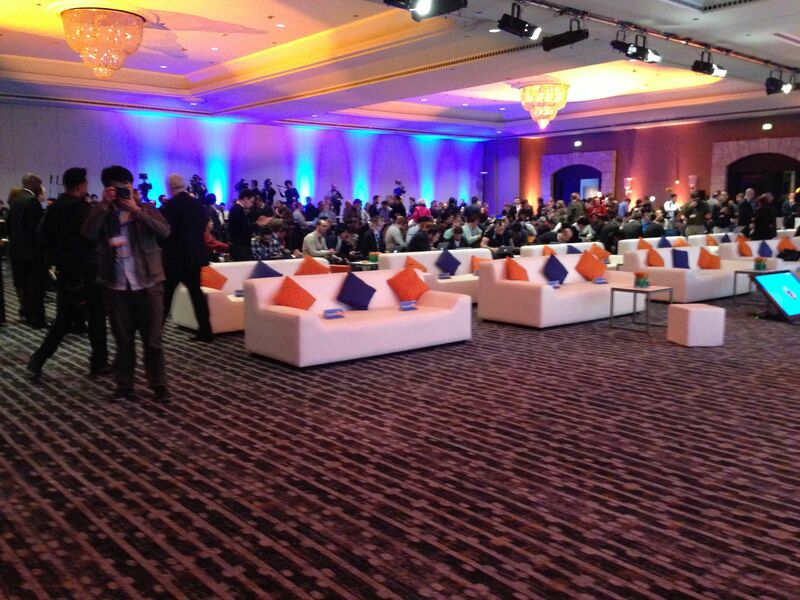 So, Mozilla is leading the effort to complete the web platform on mobile devices. Our work is bearing fruit, as shown by the industry support for Firefox OS and the W3C’s efforts to standardize the new APIs. Even Andy Rubin had some kind words for us (thanks, Andy!). The main prize for me remains the picture of smiling “mobile web developers” (read: “web developers”) that I can see just around the corner. Based on our MWC experience this year, the Web is in good shape to win that prize.